Can big really be beautiful? Why people must come first and what Marriott's acquisition of Starwood means for business travellers. Hotels can smile and survive or sulk and sink. WHILE finding friendly cabin crew on a flight can be a game of Russian roulette – like when you find a grumpy bunch say on the pink-eye to New Delhi – travellers take much for granted at hotels that are expected to create a uniform experience by hiring with care and then dinning into young minds that the customer – barring boorish bloggers who may be waterboarded at will – come first. Humans are the ‘H’ in hospitality and it is always they who are responsible for the quality of the customer experience, not some highfaluting mission statement or hi-tech marvel. As travel hits a dull patch with terrorism and economic slowdowns swamping headlines, the travel industry has found itself in a difficult spot, having promised the earth but delivered little in the way of enhanced service to attract coy customers. Goodies, once taken for granted, are being furtively or even brazenly, withdrawn. Vast breakfasts at luxury hotels have shrunk, organic butter has been replaced by little sealed packets, and hearty sausages have somehow made the transition to slim cocktail pinkies right out of a can. On airlines, welcome peanuts are disappearing – certainly not for reasons of allergy prevention – and, in economy, the tea and coffee service is a deeply endangered exercise, often enjoyed only upon request, and that too with wax paper cups rather than proud plasticware with handles. Most people will bear no grudge if an airline or hotel in distress takes steps to curb cost but there is a problem with the smorgasbord being removed by stealth on the assumption that the traveller is an imbecile and will not notice. And, at a time when the need for service becomes critical, you have young public relations managers, focused more on their latest Hermes acquisition rather than the hotel, who believe their diva status is a divine right - and hotel managers with megalomania. Smiles, graciousness, and integrity, do not appear to be in the etiquette books anymore. This does not create shock and awe. It is schlock and bore. There are times we feel like cheering for those blogger blackmailers if only to register some robust anti-establishment protest. As Marriott completed its US$13bn acquisition of Starwood on 23 September 2016 to become the world’s largest hotel company with 30 brands, 5,700 hotels and 1.1 million rooms (166,000 of these in Asia-Pacific), it may have given some travellers pause. Not because the combined behemoth yearly serves 8.7 million burgers and 1.6 million sandwiches and uses up 116 million ounces of shampoo and 84 million toilet rolls, but because large combines usually work to force prices up. That’s the bedrock of business, and monopoly. It is always tougher to negotiate a deal with a large player than with smaller independents. And in several cities, Marriott's vast inventory now accounts for almost 50 percent of the marketshare. A best rate guarantee (that slowly cuts out the online travel agent or any consolidator offering volume discounts) coupled with a solid rewards programme (that keeps guests coming back) would ultimately mean less bargaining power for both individuals and corporates. Yet, the coming together of the hugely popular Marriott Rewards (including Ritz-Carlton Rewards) and SPG (Starwood Preferred Guest) into separate but linked entities, with interchangeable points and redemptions, offers a massive incentive for customers for whom the added rewards and newer destinations could outweigh any room price increases. Marriott points to the considerable advantages of the Marriott-Starwood marriage. 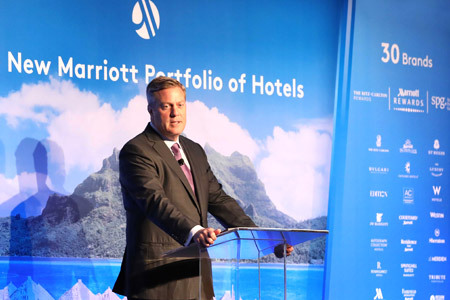 “This is not an acquisition based on reducing costs but on increasing sales, said Craig Smith, Marriott International’s President and Managing Director Asia-Pacific at the Hong Kong announcement to the press. “We didn’t buy a failing company… but our biggest competitor.” Yet, the company plans “to achieve US$250 million in annual cost synergies,” according to Marriott International President and CEO Arne Sorenson, which is a civilized way to describe deep cuts. That’s how business works. Cost efficiencies, higher yields, and better returns for shareholders. So while Marriott owners, shareholders and franchisees march with smiles to the bank, the gamble is that travellers may be smiling too in destinations as diverse as Santorini, Aruba, Bora Bora, Kruger National Park, and the Maldives. Marriott says its myriad brands enable all travellers to find their price point and desired level of service and experience anywhere in the world. It is a seductive argument. But maintaining brand differences will be a challenge, especially if travel continues to be sluggish and hotels dip into each other’s customer portfolios and brand menus. A general manager from a modest hotel transferred to a luxury property may be tempted to extract cost savings in unusual ways, in theory chipping away at the brand, not unlike British Airways Chairman Alex Cruz (from Spanish budget carrier Vueling) who is rumoured to be toying with charging economy passengers for meals and snacks. And pride ensures a GM from a top property say helping launch a budget boutique may be tempted to raise the brand standard too high, thereby impacting on price. These things happen all the time. Interestingly, as a brand with a friendly ‘family’ feel and management style, Marriott understands the value of the ‘H’ in hospitality. Its stated goals are - put people first; pursue excellence; embrace change; act with integrity, and; serve our world. It is a mantra that works. These aspirations should be in every travel company’s lexicon. Combining innovation like mobile check-in, and using cell phones as room keys, with the addition of the ‘botlr’ (a tuxedo-clad R2-D2 that whirrs about corridors making deliveries at Aloft), Marriott plans to stay at the forefront of change – while putting people first. It is what helps Marriott retain staff, and customers. Starwood’s excellent training programmes and systems, a benchmark for the industry, will be an added bonus. There’s a lesson here for grumpy staff and preening PRs. Hotels can smile and survive or sulk and sink. Whether the organic butter and real sausages return to the breakfast table, remains to be seen. A fun read. I haven't encountered PR divas or 'megalomaniac' managers but I have personally witnessed the shrinking of buffet spreads across Asia. I like my breakfasts big, and with lots of choice. It's a tall order these days. All I can say is, any near monopoly of this size is bad news for travellers. A great read and well articulated but the author could have spent more time looking at the room rate implications.